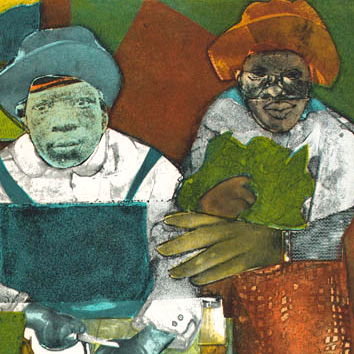 Romare Bearden (American, 1911-1988) was one of America’s most well known Modernist artists. Pictures of America presents his colorful and complex art that synthesized multiple processes. His life experiences in rural Mecklenburg county, North Carolina; Pittsburgh, Pennsylvania; and Harlem in Manhattan, New York City were instrumental in developing imagery in his work. Bearden’s art celebrated and shared stories relevant to African Americans, which he integrated into the greater American Modernism art movement. Born in Charlotte, North Carolina to a middle class African American family, Bearden moved as a toddler to Harlem in New York City, with his parents during the Great Migration of African Americans in 1914. The Bearden home became a meeting place for Harlem Renaissance luminaries including writer Langston Hughes, painter Aaron Douglas, and musician Duke Ellington, all of whom undoubtedly stimulated the young artist’s imagination. Bearden maintained a lifelong interest in science and mathematics, but his formal education was mainly in art, at Boston University and New York University, from which he graduated in 1935 with a degree in education. He also studied at New York’s Art Students League with the German immigrant painter George Grosz, who reinforced Bearden’s interest in art as a conveyor of humanistic and political concerns. During a career lasting almost half a century, Bearden produced approximately two thousand works. Best known for his collages, he also created paintings, drawings, monotypes, and edition prints; murals for public spaces, record album jackets, magazine and book illustrations; and costume and set designs for theater and ballet. Culling snippets from magazines such as Ebony and Jet, Bearden inserted the African-American experience - its strife and triumphs-into his art. In describing his artistic influences, Bearden once commented, “The artist has to be something like a whale swimming with his mouth wide open, absorbing everything until he has what he really needs.” Bearden’s densely layered works presented topics from slavery to the history of industrialization and music inspired by his 14 years of having his studio over the historically important Apollo Theatre in Harlem where countless African American musicians played. In addition to making art, Romare Bearden was a social worker for the New York City Department of Social Services for over thirty years, a writer, a teacher, and advocate along with other artists during the Civil Rights Movement. He received numerous honors and awards during his lifetime such as the Mayor’s Award of Honor for Art and Culture in New York City in 1984, and in 1987 President Ronald Reagan awarded Bearden The National Medal of the Arts. His work is in numerous permanent collections including the Brooklyn Museum, the Mint Museum, Museum of Modern Art, and the Metropolitan Museum of Art. One of the most vibrant and revolutionary artists of the 20th century, Bearden’s legacy still has influence today. 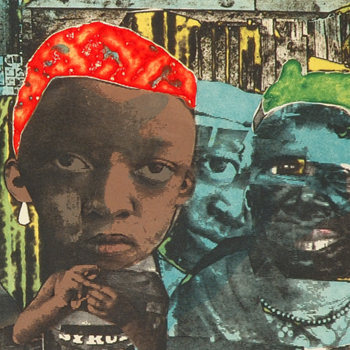 By mixing and sampling images taken from popular sources, Bearden created works that highlighted a pivotal time of cultural development that occurred in the United States. 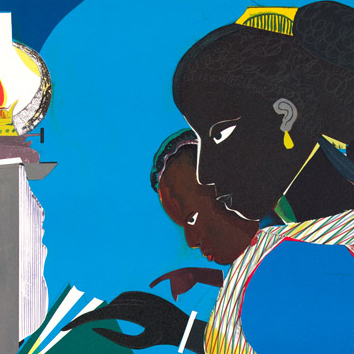 Romare Bearden: Pictures of America is curated by Amy G. Moorefield, Deputy Director of Exhibitions and Collections, Taubman Museum of Art. This exhibition will be on view from January 28 - June 18, 2017, in the Bank of America/Dominion Resources Gallery. 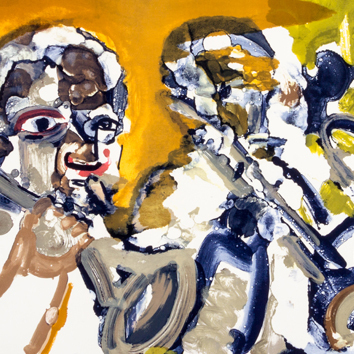 Brass Section (Jamming at Minton’s), from Jazz Series (detail), 1979, Color lithograph on Arches paper, 24 x 32 3/4", University of Richmond Museums, Museum purchase with funds from the Louis S. Booth Arts Fund, H2015.12.05, © Romare Bearden Foundation, Photograph by Taylor Dabney.